Join Roary, a bright red, cheeky and energetic single seater, Big Chris and their amazing racing car friends at Silver Hatch racetrack! Featuring 8 fantastic episodes: Putting On A Show Tall Story Roary Flash's Tea Party Horse Powered Dinkie FB's Sleepover Funny Business Dancing Queen Motormouth..
Join Roary, a bright red, cheeky and energetic single seater, Big Chris and their amazing racing car friends at Silver Hatch Racetrack! Roary's First Day: Roary is nervous before a big race the next day. Big Chris tells him the story about the day the brave little red racing car arrived at Silver Hatch Racetrack. Big Chris Flags It Up: Marsha is feeling ill and gets sent home. Disaster strikes when Big Chris takes over her job and mista..
Join Roary, a bright red, cheeky and energetic single seater, Big Chris and their amazing racing car friends at Silver Hatch racetrack! Featuring 8 fantastic episodes: Silver Hatch Heroes It's Go, Go, Go at Silver Hatch Heavy Loada Demolition Derby Silver Hatch Fun Run The Silver Hatch Stars Workshop Chaos Pit Stop Perils..
Join Roary, a bright red, cheeky and energetic single seater, Big Chris and their amazing racing car friends at Sliver Hatch racetrack! Featuring 10 fantastic episodes: Plugger's On the Case Roary Goes Back to School The Rabbit That Yelled Stop Roary's Wake up Call Roary Cleans Up His Act Flash the Marshall FB's Sleepover Marsha's Wonderful Life Nick Solves the Case Mum's the Word..
Join Roary, a bright red, cheeky and energetic single seater, Big Chris and their amazing racing car friends at Silver Hatch racetrack! Episodes: Big Chris Babysits Cici Gets Fired Up Tin Top Gets Scared Roary Loses A Friend Computer Calamity Roary Sees Red Big Chris Says Sorry Roary And Nigel Roary Gets It Wrong Green Eyed Roary Big Chris Forgets Rusty Takes A Trip..
Join Roary, a bright red, cheeky and energetic single seater, Big Chris and their amazing racing car friends at Silver Hatch racetrack! Featuring 10 fantastic episodes: Tunnel Vision Roary Goes Missing Surround Sound Braking Promises Roary On Thin Ice Hellie's a Winner Dodgems Law and Order Cici Spectacular Cry Cold Special Features Decorate The Christmas Tree Game..
Own Roary The Racing Car - Christmas Gift Pack DVD from Deff, DVD, Blu-Ray & 4K Video Specialists - Free UK Delivery..
Join Roary, a bright red, cheeky and energetic single seater, Big Chris and their amazing racing car friends at Silver Hatch racetrack! Episodes: FB In The Fast Lane Spooky Forest Roary Digs Deep Testing Time For Maxi Crash Test Roary Go Gadget James & Maxi Cici Wins The Day Mr Carburettor Or Bust..
Own Roary The Racing Car - Musical Mayhem DVD from Deff, DVD, Blu-Ray & 4K Video Specialists - Free UK Delivery.. 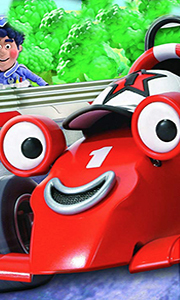 Eight episodes of the CGI-animated adventure about a bright red, cheeky and energetic single seater racing car who lives at Silver Hatch racetrack. He has the spirit and sense of a young boy - which means that his boundless enthusiasm and curiosity often lead him into trouble. Set in and around the racetrack, the stories explore Roary's relationships with his racing car friends and Big Chris (voiced by Peter Kay), the karaoke-loving mec..
Another collection of episodes featuring Roary the CGI-animated red sports car and his friends at Silver Hatch racetrack. Roary (voice of Maria Darling) is a young racing car, filled with enthusiasm and desperate to win. His very enthusiasm often leads him to make mistakes, but he has a good team around him to make sure he learns for next time. As well as his best friend, fellow racing car CiCi (Darling), Roary is looked after by mechan..
Join Roary, a bright red, cheeky and energetic single seater, Big Chris and their amazing racing car friends at Silver Hatch Racetrack! Stars 'n' Cars: Big Chris is going to appear on a TV karaoke show. The others are worried the success will go to his head. A Busy Day For Big Chris: Poor Big Chris is trying to relax, will he ever get a minute to enjoy a cup of tea and a biscuit?! Tip Top Tin Top: Tin Top is trying his hardest to av..
Own Roary The Racing Car - Ultimate Bumper Collection DVD from Deff, DVD, Blu-Ray & 4K Video Specialists - Free UK Delivery..
Join Roary, a bright red, cheeky and energetic single seater, Big Chris and their amazing friends at Silver Hatch racetrack! Featuring six fantastic episodes: Winter Breeze: Breeze is visiting the track. The beach is boring in the winter as nobody comes to visit. She tries her best to help everyone get ready for the winter festival but doesn't seem to be good at anything… Car Boot Sale: Big Chris has a clear out and takes all his ol..